Skate Today, Skate Tomorrow, Skate Moore! Push Your Roller Skating Endurance to the Next Level! Obviously, there’s not many activities that we enjoy more than roller skating, and our skaters can definitely relate! If you are new to skating or have taken a brief hiatus you will notice something quickly. This fun activity is also a great workout, and it can be easy to tire out before everyone else at first. Building your endurance can take some time, but Skate Moore, located in Moore, OK, has a few tips to help you on your way! Push it to the Limit – The only way to improve is to move forward. Every time you skate try to go a little farther than the last time. If you keep increasing your skate time in little increments, you will be skating as long as everyone else in no time! Be Healthy – It’s important when you increase one area of your health to increase all areas. To maximize your endurance, be sure to eat a well balanced diet. 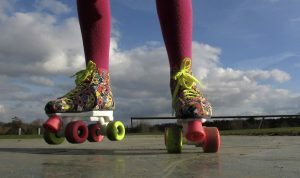 Form – In roller skating, form is everything. A flawed skating form can cause someone to do more work than is necessary. Be sure to watch videos and ask questions from experienced skaters until you’ve got it down. Skate Everywhere – Roller skating is for more than just the rink. Try skating on multiple surface to help get you used to being on skates. Join us at Skate Moore and let’s get to work on your endurance! Check out our hours and plan your next visit. We are a family owned and operated skating center in Moore, OKlahoma. We opened our doors in 2002 and are still skating today! Our goals are to provide a safe, clean, fun, and wholesome place for families, young children, and teens to meet, socialize, and skate. Gather your friends and family together and join us for the next public skate session or book a special event with us! Skate Moore Skate Center provides a variety of fun-filled birthday party and team building event packages. Interested in booking a party? Visit our party page for more info!